Despite being one of the oldest designs on the market, the full-size, light-duty Ram 1500 has still been one of the most desirable trucks in the industry. The sales of the model have actually grown for about 5 percent in the 2017 model year compared to the same period a year before. This truck is known for delivering smooth ride thanks to the unique coil-spring rear suspension and also has a well designed cabin. The tough look also stands out this truck from others and model is also available in many configurations and equipment levels. However, the truck is missing some of the latest driver assistance systems and max towing capacity is bellow top competitors. The new and redesigned 2019 Ram 1500 is a few months far from the debut and according to so far known details, the FCA will address truck’s weak points while not depart far from the roots. The model will introduce structural upgrades and evolutionary styling changes. Upgraded powertrains and the latest tech and safety systems will also be the part of the redesign. The redesigned 2019 Ram 1500 will arrive on the upgraded underpinning which will also be the base of the new Jeep Wagoneer and Grand Wagoneer. The redesigned platform will provide improved structural rigidity and allow better towing limits while will also affect model’s performance. The model will also receive some suspension upgrades but will retain the current rear suspension form. As for the bodywork, the Ram will mostly stay loyal to the steel structure but in some sections aluminum will be used in order to reduce some of the weight. 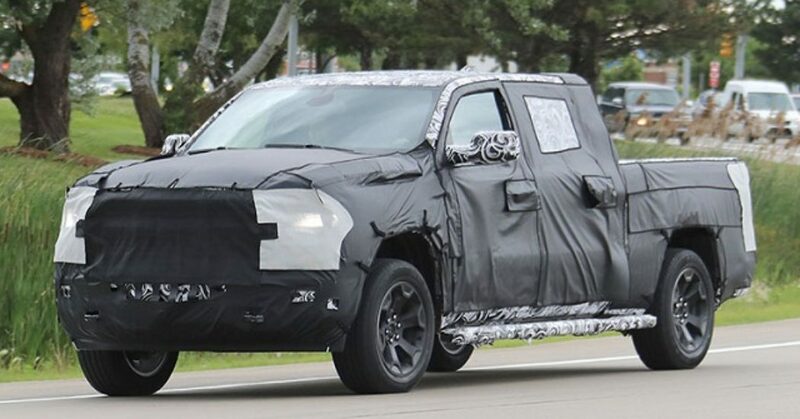 Based on the spy shots, the new Ram 1500 will also display evolutionary styling changes. Up front, we should expect to see the slimmed down grille version and it will have different designs on each trim level as it is the case in the current version. The new model will also get new headlights with the new shape and LED elements. The hood of the model will also be re-sculpted. Inside the cabin, we should expect a huge technology update and refreshed materials and patterns. The center stack will get a larger touchscreen with latest Uconnect interface. The system will handle infotainment and climate controls. However, large rotary dials will remain for the volume and tuning and the truck will also retain a rotary dial for transmission. What is important for the new Ram is the addition of the active driver systems which recently refreshed F-150 has in excess. The new safety suite will lily include radar cruise control, lane keeping, forward collision warning, etc. The new truck will likely arrive in the Mega Cab form as well and will again be available in many trim options. The 2019 Ram 1500 will again offer V-6 and V-8 engine options for sure but we will see what specs new versions will have. Most of the current sales go on the 5.7-liter Hemi V-8 about 75 percent and we expect this engine in the new generation again. The base engine will likely remain a 3.6-liter V-6 but probably equipped with systems for improved performance and efficiency. We will, on the other hand, see would the diesel be on the offer again considering a potential cheating scandal. However, the mild-hybrid powertrain is also the possibility. The engines will come in the combination with the 8-speed automatic transmission. The high-performance Raptor rival could also arrive in the later phase. The new 2019 Ram 1500 should make the premiere at the 2018 Detroit Show. We expect the price close to today’s. The production will take place in Toledo, Ohio.